Your new home has gleaming hardwood floors and a gorgeous kitchen countertop. How you maintain those surfaces protect the investment in your home, because proper cleaning keeps them looking good as new. Some of these materials require special care to stay looking their best. Whether you have old hardwood floors that have been brought back to life with sanding and new sealing, or brand-new flooring, take care of it when you clean. Sweep often and use a vacuum on bare floor setting once a week. Don’t use chemical products for mopping; a mop dampened with warm water and mild soap are best, going over it after mopping with clean warm water afterwards to rinse any residue. Tile is such a practical material, it’s a popular flooring choice. Cleaning them is much like hardwood, using a damp mop (no sponge mops! ), and mild soap and water. Buff with a microfiber cloth as it’s drying for a beautiful shine. The grout is best cleaned with baking soda and water and soft brush. Sealing the grout will help keep it from having to be deep cleaned so often. Concrete is a new trend for indoor flooring, because it is polished, stained or painted, and sealed, and looks fantastic. Castile soap mixed in warm water is perfect for getting the floor clean, going back over them with clean water to rinse. Chemicals can damage the sealant, causing them to become stained. Concrete may need resealing every few years to keep them stain-resistant. Vinyl is a common flooring choice, and is easy to clean, especially the most recent types, as they are sealed. A half cup of vinegar in a gallon of warm water will clean vinyl just as well as commercial cleaners. (The odor will vanish after it dries, or you can add some lemon essential oil to combat the smell.) Stubborn scuff marks can be removed by rubbing the streak with a tennis ball, melamine sponge (“magic” eraser), or a clean pencil eraser. For less common types of floors, Real Simple has great tips for cleaning bamboo, cork and natural stone flooring. Regular wiping with plain warm water is your first defense in cleaning any stainless surface, followed by a microfiber cloth or paper towel drying. Glass cleaner or a mixture of dish soap, water and a bit of household ammonia will wash away fingerprints and grease spots. For scratches and scrapes, a clean cloth with a few drops of mineral oil–or even olive oil–will do the trick. Wipe in the direction of the grain, and minor scratches will disappear. 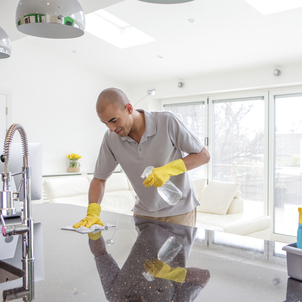 Laminate countertops are best cleaned with a cloth dampened with warm soapy water. Bleach can discolor the laminate, so for stains, make a paste from baking soda and vinegar, and apply to the stain. Allow it to sit for a few minutes, and wipe away with a scratch less sponge. Many choose granite for its antibacterial qualities, thanks to its seal. Warm water and mild soap is great for general cleaning, as well as keeping germs at bay. Don’t use bleach, ammonia or even acidic vinegar. Rubbing alcohol mixed with water in a spray bottle is a good solution if you need to disinfect. Having it resealed on a yearly basis helps protect it, as well as maintaining the germ barrier. Quartz is becoming increasingly popular for kitchen and bath, and although it’s a tough surface, treat it gently. Wiping warm soapy water is best, and since it’s a manufactured product, using anything to scour away an errant stain will scratch the surface. This Old House offers a ton of information about quartz, so see if it’s the right surface for your needs. Stone is a softer hard surface, so don’t use anything abrasive while cleaning soapstone, slate, or even concrete. A mild bleach solution is safe to use for disinfecting after a swipe with soapy water. Use a soft bristled brush with the bleach solution for stubborn stains. Cutting boards and countertop areas made with butcher block are best kept sanitized with hot soapy water, and even a water-vinegar mixture. If a scrubbing is necessary, sprinkle the surface with salt, and use a half lemon as a scrubbing pad. The acid in the lemon combined with the abrasiveness of the salt will keep your wood surface clean. We are bombarded by advertising with messages that we need a certain product to keep our homes cleaned and sanitized. Natural cleaners, and mild detergents clean just as well, if not better, all while protecting the surface. If you have a big mess that you can’t take care of, call a pro for advice or to do the job. You chose your appliances, countertops or floors for a reason, and keeping them in top condition will help them hold their value.